The invoking object contains the call site, and the call site determines the ‘this’ binding. Now, as promised, we are back to cover the worst case ‘this’ scenario callbacks, or how to find the ‘this’ binding for a function that is passed as an argument into another function. 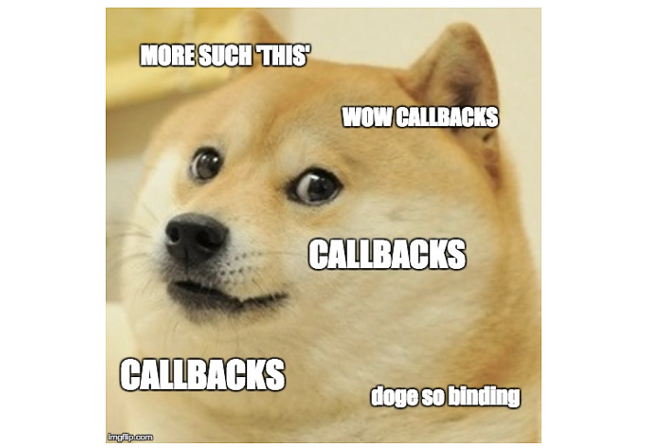 Clutch your head and weep no more, because there are tricks to be learned — both for identifying callback ‘this’ and, if all else fails, how to just go ahead and force an explicit ‘this’ binding. The callback function gets executed (called) inside the higher order function, but not necessarily immediately. It gets “called back” — hence the name — at whatever point serves the code’s purpose. Callback functions are at the mercy of whichever higher order function they are passed into. In other words, to track down what a callback’s ‘this’ is pointing to, you need to inspect the higher order function enclosing it. You can identify ‘this’ by looking at how the outer function, higherOrder(), works: it is defined in global scope, so its ‘this’ will point to the Window object as its invoking object. You can’t tell what ‘this’ will be by looking at the callback function — getThis() after all is scoped to Window. You need to look at how getThis() is being called by the higher order function, in this case, an invoking object that calls that callback as a method. The invoking object contains the call site, and the call site determines the ‘this’ binding. Where a function or method is defined has nothing to do with where its ‘this’ is pointing. Even though callback functions add an additional layer of complexity that requires a bit more of a think-through, at the core they aren’t any different from a regular function. What if we wanted to control where ‘this’ points and change the value of window to something else? This is where bind(), call() and apply() come in handy. All three are built-in methods on functions. Again: note how bind() does not invoke the function; it returns a copy of the function, which is why when you use bind() the new function it first needs to be assigned to a variable, and then called. In our example, bindThis() returns the copy, with ‘this’ set to the new object (“saying: ‘Such bind!”). So even though bindThis() was created from the original getThis() function — whose own ‘this’ remains Window — we were able to explicitly set ‘this’ for bindThis() to something different, of our own choosing, even though bindThis() is calling the global getThis() function. Similarly, we can use apply() and call() to change the ‘this’ value inside of getThis(). If you don’t pass any arguments into the function, apply() and call() behave exactly the same way. But in a function that accepts args, apply() and call() are slightly different. Let’s modify our getThis() function so it accepts two arguments. One is a name, and the other a saying. With apply() and call(), we take our default function getThisWithArgs() and first pass in the chosen ‘this’ value, and then second pass in our arguments. For apply(), the arguments are passed as an array; in call() arguments are passed in one by one. This is a very small difference and one that should be pretty clear when the times comes to actually use apply() vs. call(). It’s important to bear in mind that once bind() sets a chosen ‘this’ value, it’s immutable. That is, a function returned from bind() can never again be bound to a different ‘this’ value. Functions can only be bound once. Choose wisely, grasshopper. Happily, identifying ‘this’ for callback functions works the same way when you want to set exactly what ‘this’ will be using bind(), apply() or call(). Given that they work pretty much the same way, with slight variations, we will just do a quick bind() demo. (Flashback: the important difference to keep in mind is that apply() and call() both set the ‘this’ value inside a function and then run it immediately. Bind() returns a copy of the function without running it, so you must explicitly call it). Just try to remember this single upshot: callback functions are completely at the power of the higher order function calling them. That outer enclosing function is the call site. Inspect the outer function, see what’s going on there, and you can track down a callback’s ‘this’ — no matter where that slippery little sucker is trying to hide.